What a fun day for a great partnership! Every quarter, Becky Fleck of PageMaps dishes out 10 fabulous sketches to get those creative juices flowing with her CardMaps. Well, this month some of the lovely ladies from Flourishes did the honors and took her sketches to bring CardMaps to life with beautiful and creative samples for each and every sketch. To check out CardMaps for September, click here and then click on the CardMaps link on the left. HERE is the direct link. I had a really fun sketch that was 6 x 6, which is a very unusual size for me, but there's so much space then to be creative! Here's the direction I went with the sketch. I love how rich these Sunflowers can look, but I wanted to challenge myself and give them a lighter touch using instead the Daffodil Copic Collection from Flourishes for the coloring. I did a little pointillism in the center of the Sunflower to mimic the wonderful texture of sunflower seeds. All of this was cut out and popped up on the pinked circles which was also run through the dotted embossing folder. I've used two pretty ribbons as well, Ivory silk and deep olive crochet trim, then some lovely Kaiser pearl accents surrounding the circle, and around the SUNFLOWER words to match up with the sketch. The rest of these great ladies from Flourishes are also showing samples with Becky's Sketches so be sure to see their fantastic inspiration! Absolutely GORGEOUS Sunflower...WOW your coloring is outstanding!!! BEAUTIFUL CREATION!!! It's so pretty, Christine! I love how you used the word to make a border. Beautiful soft coloring and lots of special touches. Absolute perfection! Oh Christine your sunflower is so pretty! I like the papers, very pretty! This is gorgeous Christine!! Of course, I adore the sunflower!! And the sketch with the sentiment border is fabulous!! Beautiful colors and cut work detailing, Christine! Lovely card as always! This is so pretty Christine. I love the way you used the sketch.. It is so hard for me to color a soft image..This looks great. Christine, as always, your coloring is BEAUTIFUL! Gorgeous card. 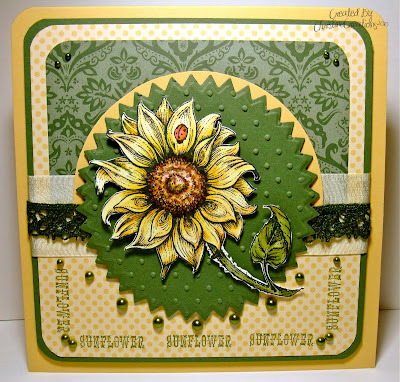 Wow, Christine, I LOVE your subtle colors for the sunflower!! All the texture is just yummy and your use of the pearls is so perfect!! This is so gorgeous, Christine!! Your coloring is always super fantastic. Great papers and the word frame too! This is gorgeous! Love those green pearls! I love all of your cards and this sunflower is so beautiful. I love the layout and the embossing and your coloring is wonderful! I like the hot colors you used before for the sunflower, but these cooler tones are lovely too! WOW Christine! This is one beautiful piece of artwork! Love it! BEAUTIFUL! Love all the pearls!